It use a proprietary sol-gel formulation infused with a colorimetric pH indicator dye. This material is coated onto our exclusive patches to reflect light back through the central read fiber or to transmit light through in order to sense the color change of the patch at a specific wavelength. While typical optical pH sensors are susceptible to drastic changes in performance in various ionic strength solutions, Ocean Optics’ sensory layer has been chemically modified to allow accurate sensing in both high and low salinity samples. 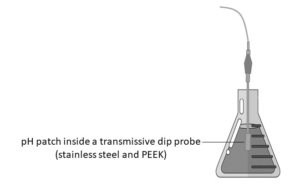 CUSTOM: IDIL can modify standard probe specifications (temperature resistance, fiber types, additional part…) or manufacture specific pH probe upon request. This pH sensor turns your visible wavelength spectrometer and light source into a transmissive pH probe. By integrating a flexible dip probe, we offer a robust sensor for in-situ applications. It is compatible with aqueous solutions, ethanol/methanol solutions, ammonia, peroxides, and sodium hypochlorite solutions.